Satan falls in the presence of Christ . 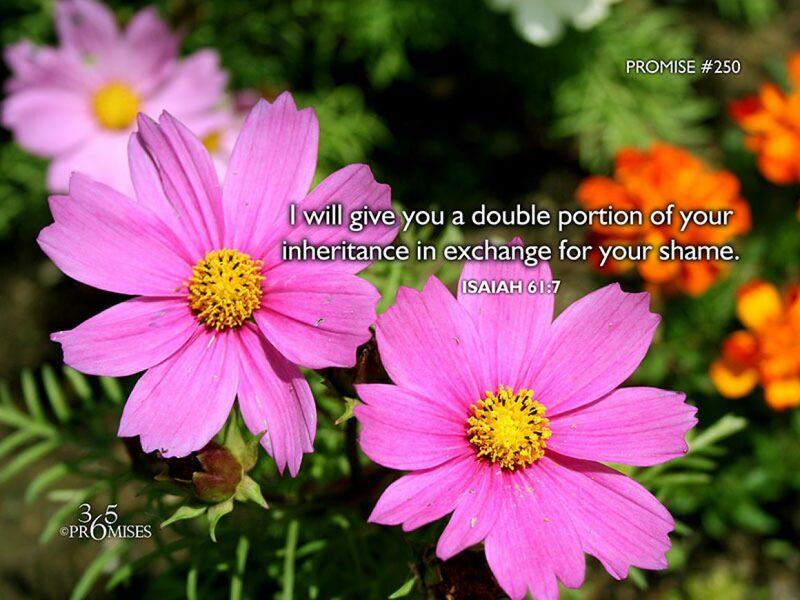 . .
Satan is powerless against the protection of Christ. Hell will have to get through Him to get to you. Jesus is able to protect you. He will get you home. 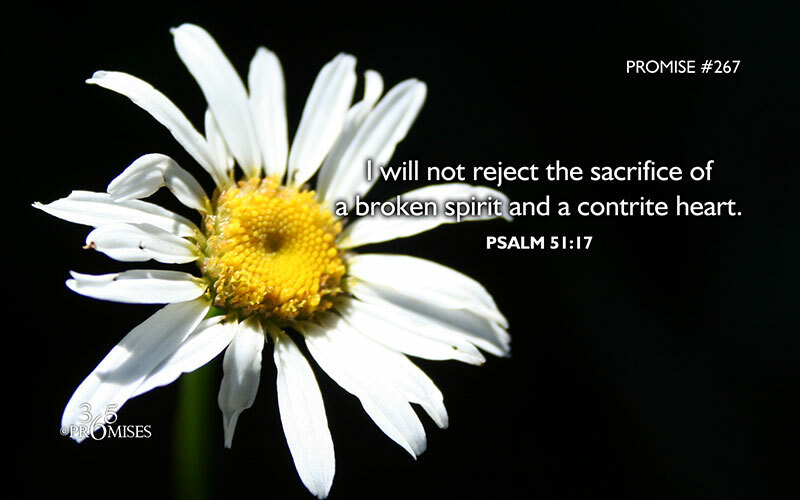 Promise #267: I will not reject the sacrifice of a broken spirit and a contrite heart. I am so thankful that the sacrifices that God accepts are those of a broken and a contrite heart. Psalm 34:18 says… The LORD is close to the brokenhearted and saves those who are crushed in spirit. NIV When we are feeling the farthest away from God, He is actually the closest. He does not abandon us in our times of crisis and struggle for He has promised to save us even in our darkest time. King David wrote this Psalm after it became public knowledge that he had sinned with Bathsheba. His illegimate affair caused a world of hurt and pain for many people. It was at David’s lowest point, that he had a revelation of God’s love and kindness and mercy. Perhaps David expected God to reject him for his sin? Perhaps he was surprised to feel God’s nearness in the midst of his darkness? Whatever he felt, he knew that God saw his broken heart, and God knew that David was truly sorry for his sin. For many of us, when we sin against God, we run in the opposite direction of Him assuming that He will turn away from us. The opposite is true! When we are our lowest point, He is very close to us and He promises to save those who are crushed in spirit. destructive innuendo, and by refusing to keep alive an ugly rumor. heal those whom I have wounded with my participation in gossip. seeking to spread gossip. In Jesus’ name I ask it. Amen. Mount Gilboa, located in the Lower Galilee region, south of the Sea of Galilee is one of Israel’s most beautiful spots. Whilst spring saturates the mountains in pretty wildflowers, no matter what the season, Gilboa is a stunning, tranquil area to explore, offering a break from the intense summer heat with a cool breeze. The Gilboa Scenic Road is your access point into this array of hikes, viewpoints, picnic sites, bike paths, and stunning outlooks, and is a great path to follow when exploring the area. The Gilboa Scenic Road is Road 667 which runs Road 90 (the Jordan Valley Highway) to Road 675, which is off Highway 60 (the main road leading from the center of Israel into the Galilee. The road follows the ridges of Gilboa providing amazing scenic views and stop-offs. As you enter the Gilboa Scenic Road from Road 60 and Road 675 near the town of Afula, you begin to climb the 18 kilometer long Gilboa Ridge which juts out from the northern side of the Samarian Mountains. 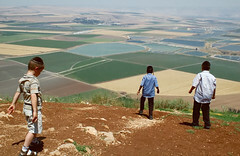 The stark landscape of the region is as a result of Gilboa’s proximity to the Syrian African Rift Valley (part of the Great Rift Valley) which has created steep cliffs on Gilboa’s northern and eastern sides, providing even more breathtaking views across the Harod and Beit She’an Valley. At its highest, Gilboa reaches 650meters above sea level, and whilst not high in mountain terms, in a region surrounded largely by valleys and lowlands, provides a strong contrast. Each of the peaks along the Gilboa Scenic Road are named after famous Biblical characters and events. Driving the road from the Afula side, the first you will reach is Mount Shaul (Saul) which juts out from the rest of the ridge. Here, drive down the track and you will see, through a break in the pine foliage, you will see a ‘window’ open unto a special view of Gilboa dropping down into the valley, and the valley beyond. From here, you can see Biblical events such as at Givat Hamoreh (to the north) where the Philistines camped before going into battle with Saul, and the adjacent valley in which the Midianites were housed before they were routed by Gideon. Beyond, to the east, the tip of Mount Tabor, can be seen, famous for Barak and the prophetess Deborah, the Heights of Issachar (who fought with Barak). To the west can be seen Upper Jezreel Valley (known in Christianity as the Valley of the Armageddon where the world will end). Mount Shaul is especially popular for outdoor pursuits, and in particular paragliders, who take take advantage of the steep cliffs and flock to the area at weekends and holidays. Beyond Mount Shaul lies Kefef Shaul (Saul’s Shoulder) which is the main recreation area in Mount Gilboa. This is a great place to stop off, with picnic tables, playgrounds, and a nice accessible trail leading to a great lookout. Continuing along the Gilboa Scenic Road, you come to the Vinya Overlook – turn off the road and drive along the track and two balconies among the lush grove will emerge. 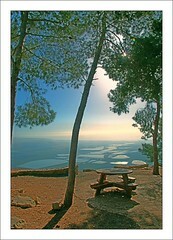 From here, more great views, including Ein Harod a kibbutz which is split into two. On a sunny days, the kibbutz’s sparkling fishponds and colorful fields are sure to make any visitor wonder why they do not inhabit this breathtaking place. Back on the trail, you will come to a great hiking spot, suitable for only advanced hikers (red marked trail) leading to a spring called Ein Hasamal. The trail becomes very steep and difficult to maneuver close to the bottom. There is, however, a treat in store for those who do hike it, with a Hidden Valley near to the bottom. If you have two cars, park the second car below Gilboa at Old Tel Yosef. If you decide the advanced trail is not for you, you still have great surprises in store as there is an easier hiking trail ahead. From the JNF Tower at Mount Barkan you can take a one hour circular path which boasts breathtaking views across the West Bank, including Nablus and the Jenin Valley. Moving along the Scenic Road, you will come to the Gilboa Iris Nature Reserve. In the cooler months when the reserve has water, take sight of these incredible flowers which appear in shades of purple. Although it is dry in the summer, you can still take a great path through the reserve to the watchtower at Mount Barkan. The final stop along the scenic road is just a few meters along, where, on the left is a great lookout called Paltiel Sela which offers a great final stop. Park near the sign and walk 400m into the shady forest until you reach some picnic tables. Gleam across the landscape and take note that this is another beautiful spot of Israel that you have been privileged enough to visit.